"As movement disorder specialists, one of the most important things we do -- other than care for patients -- is train young doctors," said Steven Frucht, MD, director of the Parkinson's and Movement Disorders Division at NYU Langone. "It has a ripple effect and enormous impact." The Michael J. Fox Foundation (MJFF) announces $3 million in new grants for researchers developing innovative ways to treat gait and balance issues in people with Parkinson's disease. The eight new awards, given to teams representing four continents, support novel technologies with the potential to significantly improve people's daily lives. Occupational therapists can be an important part of the Parkinson's care team. I spoke with Daniece Lahoud, MS, OTR/L, a senior occupational therapist at NYU Langone Health Rusk Rehabilitation, to learn more about occupational therapy and how it can help people with Parkinson's. A perfect example of why research, led by the MJFF, will eventually find the cure for PD. This new medication was just approved by the FDA will help millions have better days while we are waiting for the cure! One year ago, The Michael J. 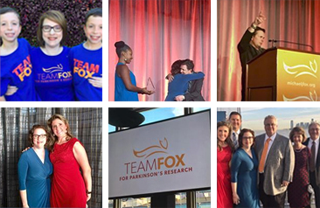 Fox Foundation (MJFF) launched Fox Insight (foxinsight.org) as an online platform for the Parkinson's disease (PD) community to share the information it knows best -- what it's like to live with PD every day. Since that time, the number of individuals enrolled has more than quadrupled from 6,500 to over 27,000 -- and Fox Insight is just getting started. The study aims to recruit hundreds of thousands of people to contribute data. Several clinical trials are testing new ways to manage Parkinson's symptoms -- from anxiety to constipation to dementia -- but they need volunteers to help assess the safety and efficacy of these treatments. Today there are more therapies to slow or stop Parkinson's in human trials than ever before. But those treatments face challenges in proving their effectiveness, and we want to ensure that even more potential therapies enter clinical testing. A study released last week by the Parkinson's Foundation found that the prevalence of Parkinson's disease is increasing. By 2030, it's estimated that 1.2 million Americans will be living with the disease. Brain exercises, or cognitive training, could help treat freezing of gait. Freezing of gait is when a person suddenly becomes temporarily unable to move, and their feet feel like they're stuck to the floor. A recent study in the journal Neurology found that traumatic brain injury (TBI) is associated with an increased risk of Parkinson's disease (PD). While this link was already known, these results add further supportive evidence. Two recent papers outline the progression of Parkinson's disease (PD) movement or motor symptoms in distinct study populations. While these findings do not provide an absolute picture of how one person will progress with PD, the results may help researchers design smaller, faster and less expensive clinical trials of new treatments. People with Parkinson's disease (PD) who experience "off" periods, times when symptoms return because medication isn't working optimally, soon may have a new treatment option. Sunovion Pharmaceuticals Inc. recently announced positive Phase III results of under-the-tongue apomorphine, which mimics the effect of dopamine, the brain chemical that decreases in PD. The Michael J. Fox Foundation (MJFF), the National Institutes of Health (NIH) and five life sciences companies today announced a public-private partnership to advance understanding, measurement and treatment of Parkinson's disease. The latest focus of the NIH Accelerating Medicines Partnership (AMP) model, this new AMP PD project will apply cutting-edge technologies to tease apart microscopic differences in the cells of people with Parkinson's disease (PD). When Nicole Jarvis, 44, was diagnosed with Parkinson's disease (PD) in her late thirties, she immediately began searching for a way to get involved. As a physician, she was drawn to understanding the scientific side of the disease and her symptoms. Moreover, as a local Norman, Oklahoma resident, she was determined to raise the profile of Parkinson's in her community and to increase resources to support patients' quality of life -- particularly for the estimated 15,000 people with PD in her home state. When a loved one is diagnosed with Parkinson's disease (PD), spouses, children and close friends may find themselves transitioning into the role of a care partner. For many with Parkinson's, care partners are an integral part of their support system and care team. For care partners, this may bring questions about how best to support a loved one while maintaining other interests and responsibilities. San Francisco-based Denali Therapeutics has raised nearly $250 million in its initial public offering, marking the largest biotech IPO of the year. In announcing terms of the IPO -- a major milestone in the life cycle of any company as it first offers stock options publicly, garnering capital for growth and expansion -- Denali shared it is testing a LRRK2 inhibitor drug in a small trial of control volunteers. Today researchers from the Parkinson's Progression Markers Initiative (PPMI) -- a landmark study to find measures of Parkinson's disease sponsored by The Michael J. Fox Foundation (MJFF) -- published the first results looking at protein levels in spinal fluid in a large, longitudinal cohort. They analyzed cerebrospinal fluid (CSF) from 173 people recently diagnosed with Parkinson's and 112 control volunteers collected at baseline (when they joined PPMI) and six- and 12-month follow-up.